You may have been to puppy or other obedience classes, but if you’re experiencing behaviour problems you may have to book an appointment with a trainer or behaviour consultant to help you work on it. While all behaviour consultants have their own techniques and methods, there are many common things that you should expect when you hire someone to help you with a behaviour problem. A thorough history, if at all possible, will help your behaviour consultant to understand how the behaviour problem has developed and how long it has been occurring. 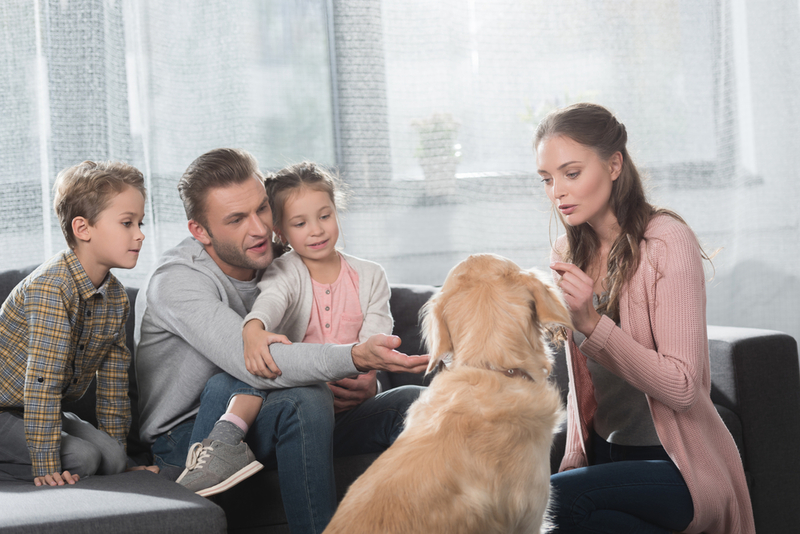 While not all pet owners have a thorough history, you may have adopted your pet more recently, thinking hard about the development of the behaviour is important. Please try not to leave any information out (we completely understand and sympathize that you might be embarrassed, wish you hadn’t reacted in a certain manner, or do something that we might not necessarily suggest). It’s also important to think about how often the behaviour is happening so that we can figure out how often it has been, or is being, practiced. They will also likely want to know about daily routines for your pet, the people and other animals in your home, or even the basic floorplan of your home. You could be asked to get some video of the behaviour occurring, as it may be one that they wouldn’t be able to observe during your consultation. These little details give information about the small things that might be contributing to the problem behaviour you’re seeing. Some behavioural problems can have a medical basis, so you will likely be asked about your pet’s medical history. Depending on the problem, your consultant may also suggest that you talk to your veterinarian. Your veterinarian may want to perform a physical exam or run medical tests such as bloodwork or analyze urine to make sure that there isn’t a medical reason for the behaviour. Your behaviour consultant should also be able to give your veterinarian a report about the problems they’re working on with you and your pet and how they are helping you work on them. It is important to note that unless you’re seeing a veterinary behaviourist (a veterinarian with specialized education following vet school), a behaviour consultant should not be providing medical advice, but instead suggesting you talk to your veterinarian if they believe there could be a medical component to the issue. A good behaviour consultant or trainer will be working on the underlying problem with your pet. For example, it may be fear that is causing your pet to act the way they do. They’ll work on addressing this underlying problem from several different angles. You should expect to discuss various options with your behaviour consultant to see what will work with your lifestyle and family. Your behaviour consultant should demonstrate or thoroughly describe some of the activities you’ll be doing and explain why you’re working on them. What about those trainers that say they’ll have the problem fixed in one session? Avoid trainers that say they’ll stop all problems immediately and use punishment to do so. While this method may make it seem like the problem has stopped, the underlying reason for the problem will not have been fixed. You may see short-term results, however it is very likely that the problem will return or show up in another way. For example - you call in a trainer because your dog is growling at other dogs. The trainer stops your dog from growling in one session, using punishment of some sort. However, your dog was growling because he was scared of other dogs. You then relax because you no longer have a growling problem and start bringing your dog around others. One day, seemingly out of the blue, your dog bites another dog. He didn’t warn that he was uncomfortable because he’d learned not to growl, but he was still afraid, so he resorted to the next method of telling another dog to go away, biting. While it may appear on TV that problem behaviours can be solved in a quick appointment with a trainer, in reality, fixing a behaviour problem takes time and work. This problem has likely developed over a period of time, and your dog has been ‘practicing’ and getting good at this behaviour. It’s going to take some time and effort to change it. A behaviour consultant should be coaching you on things you can do with your dog at home (or perhaps in other locations depending on the problem) to gradually help them. These take a lot repetition for you and your dog to get good at them. Depending on the behaviour problem you’re dealing with and the severity of the problem, there may be different stages of working on that problem. You may be starting with some basics initially and then gradually adding in more difficult steps. Once you and your dog have mastered a stage, the difficulty may be increased to work towards fixing the problem. As mentioned above, it is very important that you work on homework to improve the behaviour problem with your pet. Your consultant is giving you the tools to work on it, but it requires practice to start to get results. A good behaviour consultant will not make any guarantees when you hire them. Since a lot of progress depends on the work you’ll be putting in, we can’t guarantee you’ll see a change unless you put the time in with your dog. Certification bodies such as the Certification Council for Professional Dog Trainers won’t allow trainers to make guarantees for this very reason. The Code of Ethics states specifically “To refrain from providing guarantees regarding the specific outcome of training”. As behaviour consultants, we’re invested in helping improve your pet’s behaviour and your relationship with your pet. You and your consultant should discuss what type of follow up will be offered if you need support implementing the instructions or you run into trouble. Do you have any questions about what to expect from a behaviour consultant? Apr 13, 2018 Why does National Dog Bite Prevention Week Matter? Jan 30, 2017 Does going to the vet scare you and your pet?